Java Dance Theatre have been creating and presenting work for young audiences for more than 10 years. In this article Sacha Copland looks at ‘accessibility’ in dance through the lens of the oldest language of all, body language and the relief of physical expression. Back in 2005, Java Dance Theatre started touring primary and secondary schools with dance theatre performances. As a choreographer, schools touring transformed my understanding of accessibility. Choreographing and performing works for schools was like initiation and at times it was unforgiving as we found our feet and looked for the meeting point between contemporary dance theatre and the audience. Our shows suddenly burst out into the world. They weren’t ready and we weren’t ready but it changed how we looked at audiences and how audiences looked at us. Kids are honest audiences. If you lose their attention they will chat and squirm, if you get them hyped up they will riot, if you amuse them they will laugh, if you connect with them they will go with you. Teenagers are even more honest. If they are unimpressed they will stay unimpressed but if you surprise them and connect they will make a bigger transformation than any other group we’ve performed for. Teenagers and children naturally respond to dance. They respond to the rebellion in it, the raw physicality and the way it enables people to express themselves. But before young people can respond to dance they need to be able to access it. There are many things that impede access. Firstly, there are physical, geographical and socio-economic factors to take into account. These are often able to be solved with partnerships and planning but support has become scarcer in recent years. With the new government I am hoping that we will see a resurgence of programmes like DANZ’s LEOTC (Learning Experiences Outside The Classroom) programme and artist residencies in schools. Residency programmes use resources incredibly efficiently and enable deeper connections between students, choreographers and dancers. Students need dance. Dance can come as such a relief to some students, particularly students who are kinaesthetic learners or who simply have huge amounts of energy that makes sitting for long periods challenging. Dance can also be a huge relief for students trying to fit into a cultural paradigm that does not suit them or give them access to what they need. But access reaches beyond the logistics of the performance reaching the school. 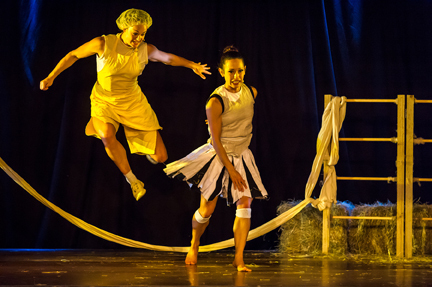 Access is about how you create the show and connect to young people through choreography. There are many different ways to do this but it does require a great deal of thought and experimentation. It requires you to trial ideas on and with young people, to think from new perspectives, to remember what it was like to be a child, to find the play in your own process and to relinquish complete control. Interactive dance for young people has started to thrive and it has transformed the range of young people who connect with dance, offering transformative experiences. Tetris, by Arch8 choreographer Erik Kaiel, is often described as a “rockstar of a show”. In Tetris the dancers give the kids in the audience a Rubik’s cube which they can use to control the dancers movements, there are endlessly inventive stacks of bodies and it is all a game. The show finishes with the audience being gradually drawn up into the space until hundreds of kids and parents are dancing. Everyone is dancing and we can no longer tell who the performers are. The space is filled with joy and the barriers between people have disintegrated. In 2017 Tetris toured to New Zealand for the Capital E National Arts Festival for young people. Shows for teenagers can play a more provocative role. An example of this is The Hamilton Complex by Belgian company Hetpaleis with choreographer Lies Pauwels. This was a work created for 13-year old girls by 13-year old girls and a body builder. The Hamilton Complex often shocks adults. It is a savage work and captures what it is actually like to be 13 years old rather than an adult’s view of what a performance for 13-year olds should be like. Dance has the power to express everything that is usually left unsaid. It can enable teenagers to access their feelings and connect with their own physicality. RIGHT NOW, THERE IS A MOVEMENT IN THE WORLD TO BRING MORE DANCE TO YOUNG PEOPLE AND THIS COINCIDES WITH AN INCREASING NEED FOR HUMAN CONNECTION. 2017, the Young Dance Network – A Global Network 2017, the Young Dance Network – A Global Network for Exchange – was started through ASSITEJ. Anyone making dance for young people can join and conversations about increasing the number of dance-specific festivals for young people are starting. In a world of smart phones and online communication, young people are going to need dance more than ever. But it’s a two-way street. Dance also needs young people. Java Dance Theatre has made work for young people for more than 10 years and the young people have helped us, as a company, to access methods of communicating through choreography as much as we have helped the young people to move and to be moved. Through interaction and feedback from the audience we started to learn more about people. Our work became a conversation rather than a monologue. In the industry we often talk about accessibility as a burden but maybe it is a gift. When choreography becomes a two way conversation and an exchange with the audience then sparks begin to fly and we all start to access the oldest language of all, body language and the relief of physical expression. Original generation time 1.4613 seconds.